A shoal of captive-bred Yellow Tangs, Zebrasoma flavescens, awaits their final homes in a coral holding tank in Duluth, MN. It was admittedly surreal to look at the holding tank in my fishroom this March and realize it housed five of the first captive-bred Yellow Tangs the world has ever known. I quipped online among my friends that I never thought that I’d see this happen in one of my tanks in my lifetime. Sure, maybe someone, somewhere, would finally breed and rear a tang, but what were the odds that I’d ever see one in person? We’ve come a long way since I wrote my first-ever fish article as a kid, probably 25-30 years ago, entitled “The Swimming Banana Nose” (yes about the Yellow Tang) for the Suburban Aquarist Society Newsletter in Chicago, IL. It’s already been widely reported that the team at the Oceanic Institute at Hawaii Pacific University (OI) was more than a just a little successful; in fact they’ve now produced hundreds of Yellow Tangs. Naysayers were quick to suggest that this breakthrough was all hype, that these fish would never see the light of day, they’d just be a research novelty. Instead, Segrest Farms (Segrest) of Gibsonton, Florida, and Quality Marine (QM) of Los Angeles, California, led the charge to bring these fish from Hawaii to the mainland US, where now most have been distributed to public aquaria and zoos who are partners in Rising Tide Conservation (a quick tally of the numbers from Segrest and QM suggest that a combined ballpark of 750 fish went straight away to about 7 institutions). All of these fishes are destined for public showing with prominent Rising Tide informational displays. Now that these fish have made their way to these “priority homes,” each wholesaler was left with the extras to do with as they pleased. QM, having sent 250 to public aquariums, is sitting on the surplus (more on that in a bit), and a handful of Segrest Farm’s remainders have been made available to aquarium retailers. If I’ve understood what I was told correctly, the actual number of fish made available to the general public was possibly well under 100, simply being sold on a first-come, first served basis (I’ve not noticed any quantity restrictions in the wholesale offerings). But just as quickly as this first wave became available, supplies are already dwindling. Some of the fishes being held back by QM and Segrest could of course be made available at a later date, but even still, these represent a very limited number of fishes. While it’s not my primary livelihood, as a breeder, wholesaler and boutique online retailer of aquarium livestock, I jumped at the opportunity to acquire some these game-changing fish. I’m aware that other retailers have obtained these fish as well. Of my first group of 10, 5 immediately went to the Lake Superior Zoo here in Duluth, MN, destined for a new 300 gallon reef aquarium that effectively has a nearly 100% captive-bred mandate. This is particularly exciting given the dearth of captive-produced algae eaters and clean-up crews…and the Zoo’s uncanny ability to grow algae in the infant reef. Having watched how quickly these captive-bred tangs decimated what little algae was present in the holding tank here, I have high expectations for them as reef tank gardeners. F1 Yellow Tangs being drip acclimated at the Lake Superior Zoo in Duluth, MN. They will spend a minimum of 60 days behind the scenes in quarantine before being introduced to the main display. One fish will remain here, in my fishroom, on principal; this is just about as exciting as the first Lightning Maroon Clownfish for me! As a person well known for my passion for marine fish breeding, I need to own one of the first captive-bred Tangs, truly a piece of aquarium history. Some people, including myself, were frankly shocked at the large size of some of these first fish; the largest is probably 3” inch in diameter, a surprising size for a fish that cannot be more than 8 months old. Ironically, one of my best aquarium friends practically complained that these were too big, the expectation being that a captive-bred tang should arrive at an adorably cute and tiny size. So, after the initial ten, three more were ordered in, the smallest being about the size of a quarter! Yellow Tangs this small are virtually unobtainable. Why? Read on! The sizes of these tangs raises two very unique side-notes. 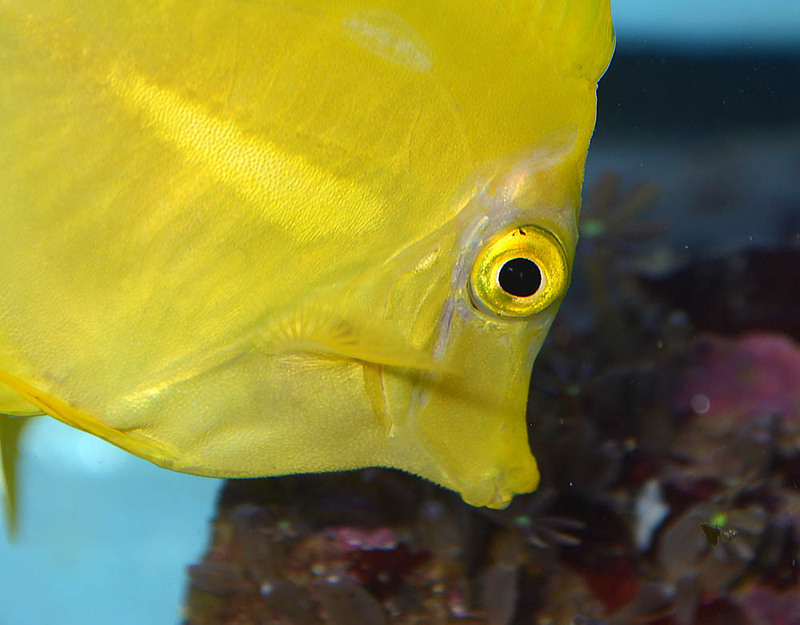 Our sources at Quality Marine noted that in some Hawaii aquarium fisheries, slot limits tend to restrict the catch of very small Yellow Tangs. This easily explains why you rarely see “tiny” or even “small” Yellow Tangs available. Putting this all together, I realized that fish in the small size range, generally less than 2″, will be more readily available if captive-bred. My working hypothesis on what usually makes a captive-bred fish commercially viable is that it has to be price competitive with the wild-caught counterpart, which might be very difficult to achieve in the current Yellow Tang market. But in this case, there is only limited wild-caught small or tiny Yellow Tangs; this is a market that could be better served through captive-bred fish. Suddenly, it’s a little more of a “name your price” when it comes to seeking out the smallest Yellow Tangs – it’s not entirely unrealistic to suggest that a “tiny” captive bred Yellow Tang can fetch more than a larger wild caught counterpart, and perhaps should. This also means that, hypothetically, producers of captive bred Yellow Tangs might not have to hold their fishes nearly as long. Not many ornamental marine fish make it to market size at only 3-4 months of age! Sandy Moore, President of Segrest Farms, looked at the largest fishes, still well under a year of age, and postulated that these fish may in fact mature to breeding size and sexual maturity much more rapidly than we currently think. This has interesting future ramifications which I’ll extrapolate further. Perhaps the broodstock difficulties noted in wild tangs might be absent in tangs reared in captivity? It could go either way, but we often find that fishes which prove difficult to spawn as wild fish can become easier over successive captive generations. For starters, there is the matter of the HLLE and/or epithelial thinning that has already been widely debated online. Every last fish that arrived here has shown signs of this condition to some degree. I should note, based on my own observations, flash photography greatly exaggerates the severity of what is present. I don’t mean to downplay it, but realistically it is not nearly as stark or contrasting when simply observing them with the naked eye. 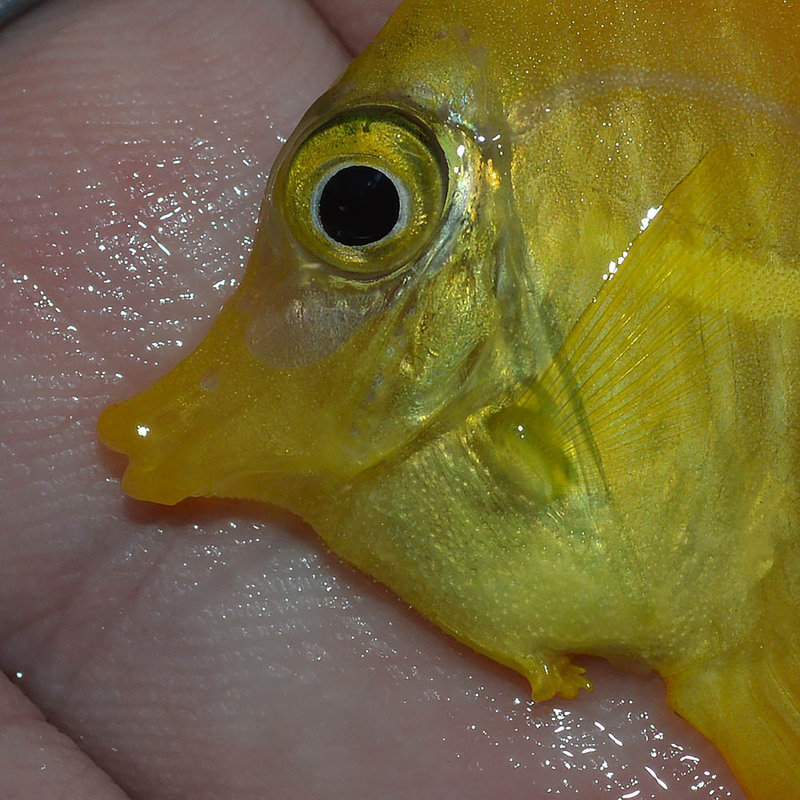 A closeup look at the erosion and discoloration seen on these captive-bred Yellow Tangs. Most of the aquarists I know believe that whatever this is, it is reversible, and to that end the fish in my care are being held in a well-lit coral holding tank. They are offered fresh Caulerpa prolifera constantly, while being stuffed full of high-quality foods including Spectrum’s Thera A pellets and Two Little Fishies Sea Veggies soaked in Boyd’s Vita –Chem Marine, Brightwell’s Max Amino, or Super Selcon (yes, I am a firm believer based on past experience that good water and a high quality diet are important components of reversing this condition when it shows up). Next, there is the fact that some of these fishes may have physical flaws. While none of these fishes show any signs of the flared gills, pinched heads or bulldog faces commonly seen in captive-bred clownfishes, at least four of the fishes that I’ve received so far have greatly reduced or damaged ventral fins. One arrived with a split and scarred rear dorsal fin. I’d be lying if I said these fishes were physically superior to the general standard we’ve come to expect from wild fishes. In fact, flaws like missing ventral fins would ordinarily be cullable offenses in modern clownfish breeding. It’s entirely unclear if the damage to the ventral fins on this captive-bred Yellow Tang is reversible or permanent, but time will tell. Nothing Good Care Can’t Fix? QM has hinted that they’ve held back some 40-odd fish in-house for observation and testing. Five specific “control” fish, representing some of the best and worst of what was initially supplied, were selected for weekly photo documentation of their condition. QM plans to release their documentation of these fish’s recovery sometime in late April, 2016. To the naked eye, at this point, sources at QM suggest there has been dramatic improvement over the last 5-6 weeks; there is basically no more HLLE / epithelial thinning, and their body weight is nearly on par with freshly imported wild Yellow Tangs. QM also noted that much of the fin damage has fully recovered as well, at least to the extent it could be expected to. Fishes that have been held in coral raceways at QM are improving faster than those kept in what I’ll simply suggest as “fish only” systems where they are feed several times a day, but aren’t necessarily able to graze constantly. 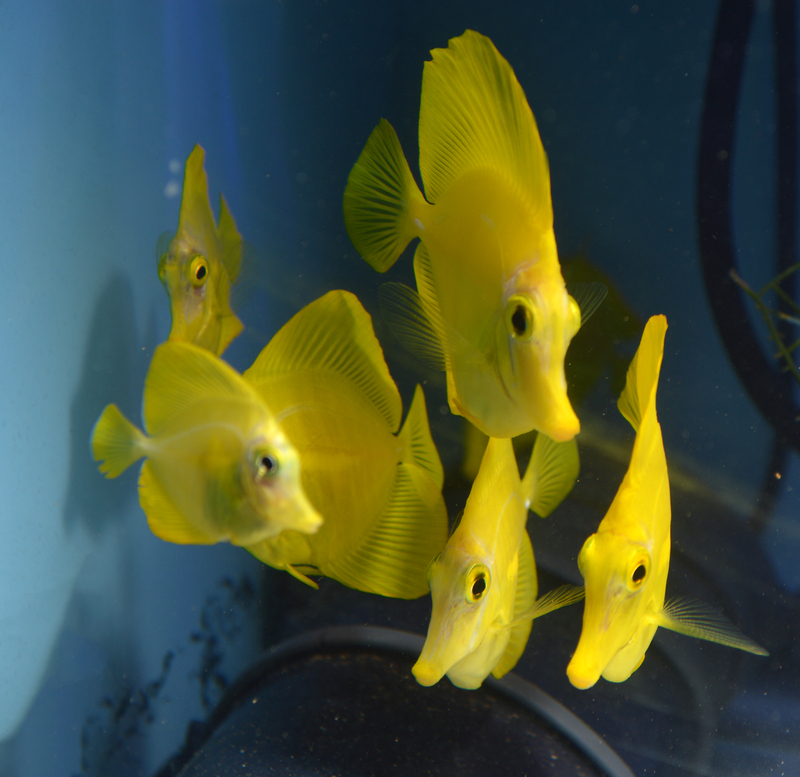 Segrest Farms has also held back sizable quantities of their first captive-bred Yellow Tangs for internal projects, and has noted that the fish placed in coral raceways and live rock systems with a lot of sunlight have shown remarkable improvement. For all the negative press surrounding these fish, I have to say this is pretty mind-blowingly good and acceptable for your very first crack at it! Everyone I’ve talked to, including folks at QM and Segrest, is delighted with these fish, despite the admittedly rough start. 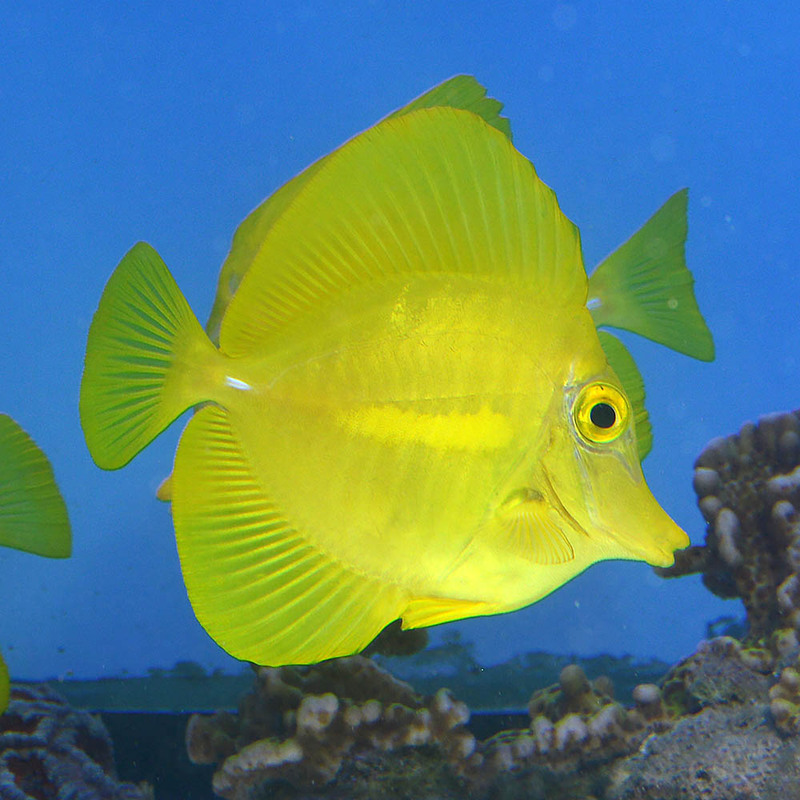 These captive-bred Yellow Tangs do seem to exhibit all the positive behaviors we expect from them. They graze algae like champs, and shoal peacefully with each other. When I introduced the three tiny fish to the pre-established larger group of five, there was about two minutes of surprised confusion, after which they all shoaled together. Within just a couple hours, the newest additions were plowing through food. These fish are eminently well-suited to captive life; it’s the only life they’ve ever known. And they are rock solid. On the 250 fish they’ve shipped out to public aquaria, Quality Marine had zero DOA claims. 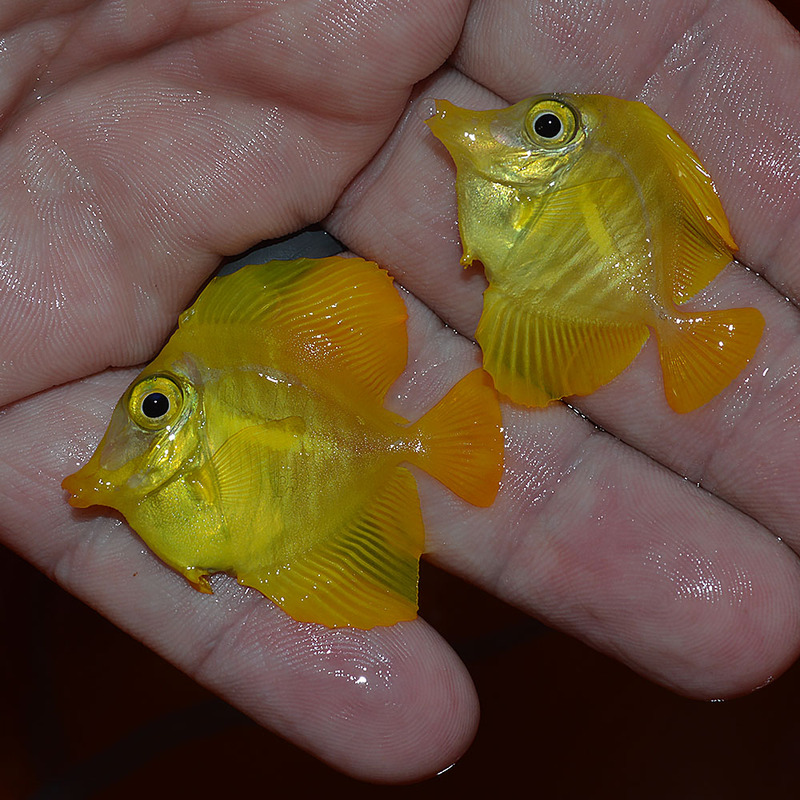 The more veteran aquarists with trade experience were in fact surprised at the rather reasonable introductory wholesale price of these tangs; even I expected them to be significantly more expensive. Still, the wholesale expense of these fish is almost more than the generally accepted retail price for a comparably-size Yellow Tang. There is certainly a premium being asked, particularly in light of what is undeniably quality that isn’t quite there yet. Prominent aquarists, and indeed the most aquarium media proper, seem to have suggested that the purchasing public overlook the flaws, and vote with their wallets to support these efforts. I’m reminded of the first commercially available captive-bred Mandarin Dragonets, for now relegated to aquarium history as a failed offering, where consumers seemed unwilling to pay the higher price necessary to make it a profitable venture. That said, some consumers and shops still adamantly suggest that the fishes themselves wouldn’t eat and failed to thrive once out in the general trade, and therefore were a waste of money from the get go. But I’m also reminded of the stories of the first captive-bred clownfishes, whose color was generally so inferior that people strongly preferred the wild-caught counterpart. Quality was certainly spotty “back in the day,” but look at the explosive growth of the captive-bred clownfish in just the last 10 years. How Does The Tang Story Start? To say we’re at a crossroads isn’t right; we’re at a starting point. 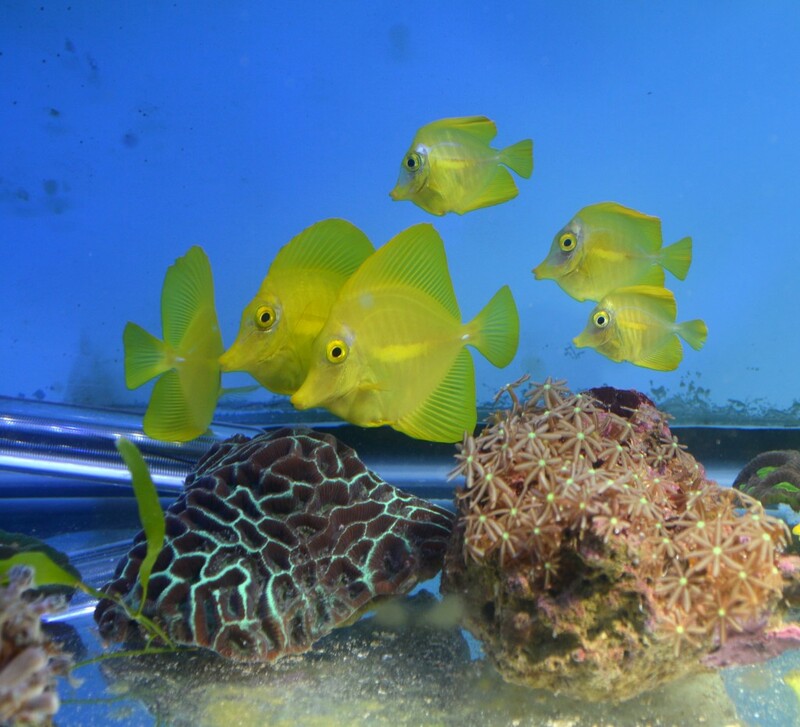 The breeding of tangs is emerging technology. OI is well into uncharted territory, and it’s not like they can pick up the phone or hop onto the Tang Breeding Facebook Group and talk with the 5 other people in the world also doing it. We don’t even known if OI will be able to consistently produce more fish yet, or if their initial success winds up only being a brief moment where everything came together just right. It’s very clear that OI has work to do when it comes to the grow-out of captive-bred Yellow Tangs, but I’m personally quite optimistic these issues can be corrected, and the reports back from Segrest and QM would seem to support that hopeful outlook. Of course, OI isn’t a commercial hatchery either way; the ultimate goal would be to offload their findings and protocols to entrepreneurial interests. At this point, the people who are buying these captive bred Yellow Tangs are doing so as conscientious supporters of this progress. However, there are only so many admittedly sub-standard Yellow Tangs that the trade and hobby can absorb at a premium price. As a long-time breeder of marine fishes, there seems to be a communal ethic of not releasing sub-standard fish given the clownfish history. The suggestion is that inferior fishes did a lot of damage to the public perception of captive-bred fishes in general, which stymied the growth of the sector. In that context, historically speaking, I have to ponder whether the release of these fish will be viewed as a good, or a bad thing? We must ask, are we repeating our past mistakes? I believe there are times when releasing something that isn’t perfect may in fact be a necessary step in the name of progress. Just as I released unquestionably “cull-worthy” Lightning Maroon Clownfishes in the name of successfully spreading their unique genetics, these Yellow Tangs have been produced, and they need to live somewhere. Either these Yellow Tangs sit around taking up resources, they get euthanized, or they get sold. What we do know is that OI needs funding, and needs it now. People are generally hesitant to just give money with nothing in return; that’s proven by the limited success of their Go Fund Me donation campaign, having raised only 22.7% of their target goal in 5 months. At the moment, OI’s sale of this first wave of fish into the aquarium trade probably gave them a much needed infusion of cash, and a first look at a possible funding avenue. I am tentatively optimistic that in the long run, we won’t remember the speed bump that seems to have occurred with the first introduction of these fish, and I’m reassured that it’s OK to release these fish in “as-is” condition. If we’re going to do our part to support this progress with our wallets, we’re going to need to entice the early adopters. Yes, that means you, the person who buys the first iPod knowing full well that next year one 10-times better is going to come out, you need to buy these fish too. And yes, you do need to brag to all your friends that you’re a conscientious reefer who is among the first to own a captive-bred Yellow Tang…or even better, an entire shoal of them, if you can find them. And no, even though I have a handful of these available to sell myself, I don’t think it’s a conflict of interest to convey just how amazing I believe these fish are. Why? Because I don’t stock fish I don’t find interesting or noteworthy in the first place! Doesn’t everyone deserve a shoal of captive-bred Yellow Tangs? With time, a bit of luck, and willing public support, maybe this will be something more of us can enjoy in the future! Given the initial wholesale pricing offered to the trade by Segrest Farms, it’s difficult to say what the retail price point should be, and that’s been the question everyone is asking. It’s impossible to say where retail prices will go from here in the short term; I expect pricing to be rather volatile for the near future. 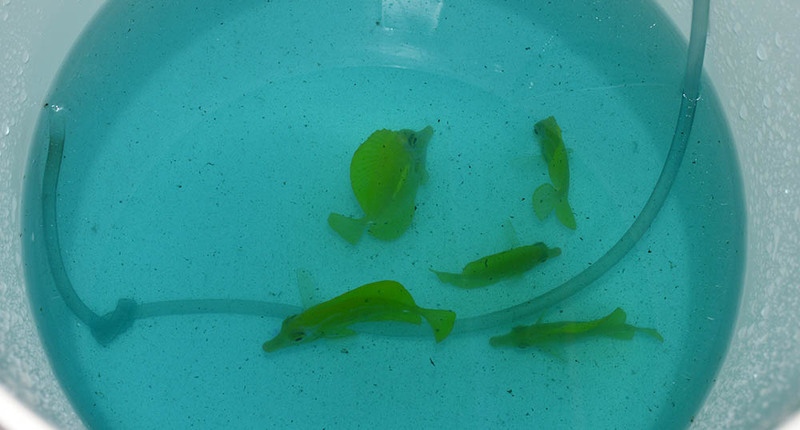 For now…I’ll leave you with video of captive-bred Yellow Tangs plowing through Vita-Chem soaked Sea Veggies!